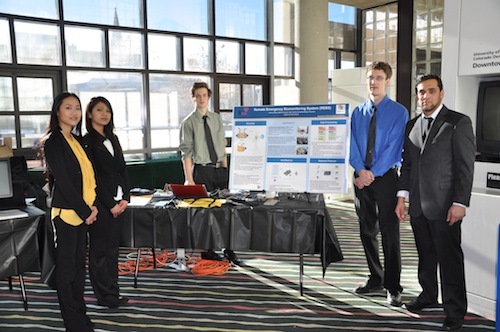 On Friday, December 13, 23 teams and more than 100 students competed in the fall 2013 Senior Design Competition. The overall winner was the Remote Emergency Biometric System team from the Department of Electrical Engineering. The project is a mobile biomonitoring system that collects and transfers vital signs data wirelessly, which enables remote monitoring for a large number of patients in emergency scenarios. Team members include Anthony Supino, Micheal Bourquin, Hoai Thanh Bui, Samir Hashem and Shraddha Shakya, and later this year they plan to compete in the 2014 Cornell Cup with their winning project. Other winners from the day’s event include Swift Tram Transportation from civil engineering, Colorado Creative Cabinetry from computer science, Magnetic Rail Spacecraft Liftoff Accelerator from electrical engineering, UCD Prosthesis from mechanical engineering and Autonomous Portable Low-Frequency Receiver and Display, a team that includes students from electrical engineering and computer science. The CU Denver Newsroom featured the competition in their Dec. 17 newsletter, and wrote a great story about the Swift Tram transportation team. You can read all the project abstracts at engineering.ucdenver.edu/seniordesign.